Recently, Amberth had an exciting task of managing the design and build of a new stylish kitchen at Commercial Road, London. With kitchen renovation being one of our specialties, we were pleased to take upon this job and we are thrilled to share our results. Before the kitchen renovation, space looked plain and felt uninspiring, all due to the commercial design that’s been installed upon the primary build. There was also a lot of unused space that has appeared due to the obstruction of the wall, which created not-so-easily accessible places. In other words, the kitchen was desperate for renovation and so we rolled our sleeves up. With a lot of efforts, patience and thoughts behind the concept, we have transformed the space by introducing a minimalistic design and a distinctive colour palette. With an aim of creating more space, part of the wall was removed. This allowed the kitchen to flow into the living room area, giving it a modern touch and transforming previously inaccessible spots into a space that can be actively used. To add more stylish accents to the new kitchen, the wall units on the back wall were replaced with a laminated finish, which was paired with the white gloss lacquer wall units in order to create a delightful balance in the space. Composite stone has been set against a glass splashback to add a raw edge to this polished kitchen, plus it creates an astonishing contrast to the solid wood breakfast bar. As the client enjoys socialising and entertaining in the space, a small white built-in wine fridge was introduced to store wine bottles. When it comes to kitchen renovation, often we do not recommend wooden flooring in a kitchen. However, we decided to be a bit bolder this time and introduced this feature in this project, adding a beautiful dark brown flooring to smoothly blend kitchen into the living room area. 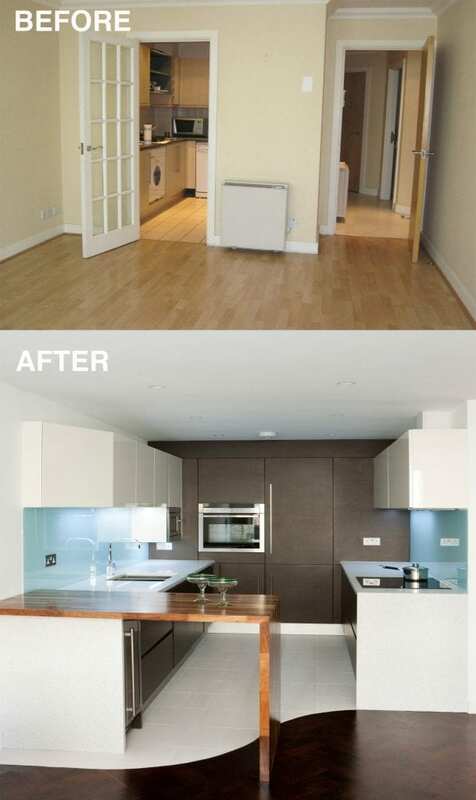 Overall, we have run a smooth project of a kitchen renovation and achieved outstanding results, proving that even the most uninspiring spaces can be transformed into something unique and beautiful. 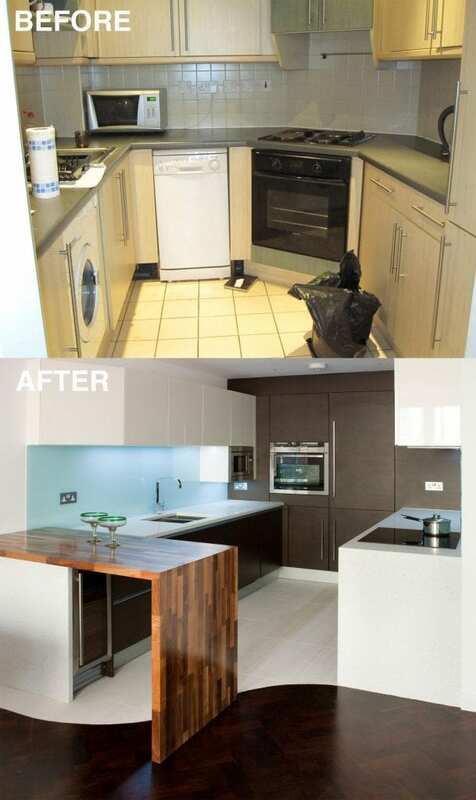 If you are thinking of a kitchen renovation then get in touch with Amberth here.